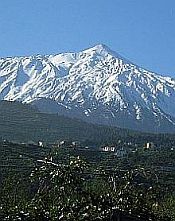 This page will try to give you all relevant information to help you make the most of your money in Tenerife. To anyone who has been a seasoned visitor to Tenerife, or Spain, over the years, the original Spanish currency, the peseta, will still be remembered. However, Spain and, consequently, Tenerife officially adopted the euro on January 1st, 2002. I was still living there at the time and, of course, it gave all the businesses the chance to put their prices up, in much the same way as happened in the UK in 1971, when decimal currency was introduced. 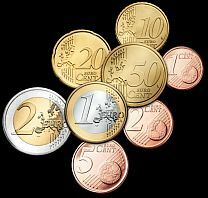 One euro is divided up into 100 céntimos. 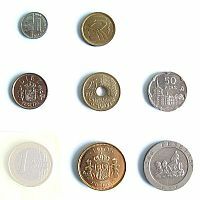 The smaller, bronze coins, the 5, 2 and 1 are not used very much, as most bar prices are multiples of 10 céntimos. You'll probably be given them as change in supermarkets, though and can be the very devil to get rid of. The way a native Canarian would say "one euro fifty" would be "uno con cincuento", or "one with fifty". The exchange rate is, of course, fluctuating all the time, so I've included here a constantly updated table for you to check before you visit the island. See how far your money in Tenerife will get you. Many people, when going on holiday, tend to change a load of money into the appropriate foreign currency or travellers' cheques. I can't remember the last time I used travellers' cheques. I'd advise you to change a small amount of money, say £100, if you're from the UK, before you go, take a load more cash for spends and change it in Tenerife as you need it. Of course, this means you'll have a large amount of cash to keep secure, so you need to make use of a safe. Every apartment should have its own safe and so should every hotel room or its reception. Use them! For goodness' sake, don't go to a bank to change money! Or, come to that, in the airport on your way. There are numerous exchange places dotted about Tenerife and their rates are as good, if not better, than anything you'll find in your home country. These places display their rates outside and it's possible to shop around a bit, although the best you'll probably manage is a difference of one céntimo. MONEY IN TENERIFE: The "IGIC"
When you receive bills in a restaurant, say, there may be a bit on the bottom that says "IGIC included", or "IGIC incluido". "IGIC" stands for Impuesto General Indirecto Canario and is the Canarian equivalent of the UK's VAT, or Value Added Tax. In other words, it's a form of stealth tax. Unlike VAT, which is 16%, IGIC is only 5%. This is what makes some bills, for example in a supermarket, such an odd amount. Residents and non-residents alike can open a bank account in Tenerife. For non-residents, it's a bit more complicated. You can either go to a main police station and ask for a non-resident certificate. For this, you'll need your passport and a photocopy of the passport, open at the photo page. They'll take about 10 days to process this. You then take this certificate to the bank and they'll open an account for you. Or, you can go directly to the bank and let them do all this for you. This will incur a charge of 15 euros, but at least you won't have the hassle of doing it yourself. Banks usually charge fees for opening and subsequently managing an account. 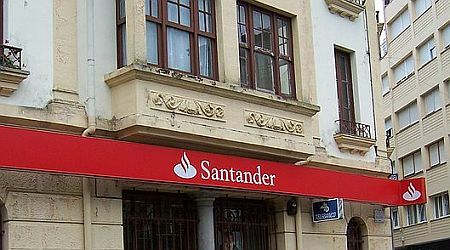 When I lived in Tenerife, I had a non-resident account with Banco Santander. Back then, this organisation was just an average Spanish bank, not the financial institution that's bought up nearly every British bank today. I was issued with an account book, with which I could deposit and withdraw money and, also, a bank card, to use in an ATM.